The event is being held from Monday, Dec. 5 through Friday, Dec. 9, and will coincide with Computer Science Education Week. 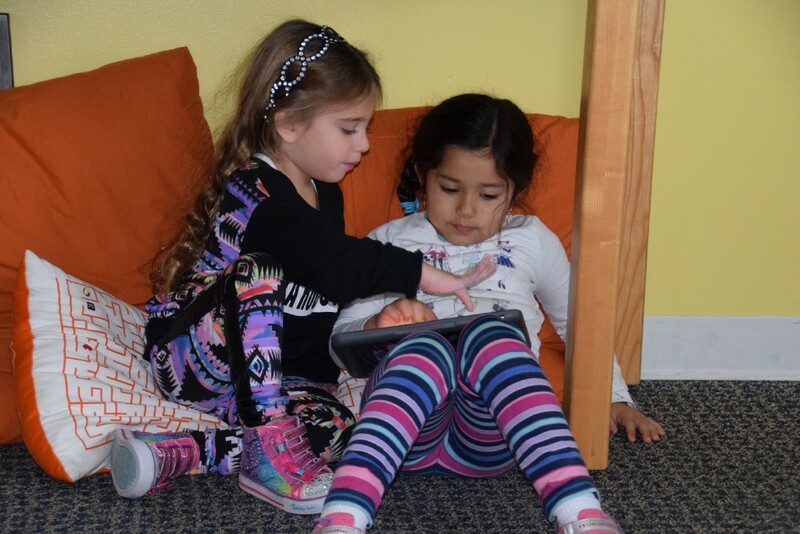 Kindergarden students at the Moorestown Friends School, Alexa Cohen and Savithri Khavulya practice their coding skills during class on Tuesday, Nov. 22. In seeking to provide students with useful life skills, the Moorestown Friends School adopted a coding program in its preschool and Lower School through grade five in 2015. In the year since its inception, the program has seen much success, and to showcase this outcome, the school will be hosting a Coding Program Sneak Peek Week from Monday, Dec. 5 through Friday, Dec. 9. “A lot of people hear ‘coding,’ and are not really sure what that would look like. So, this is an opportunity for parents to come see me teach the preschool through kindergarten classes,” the school’s first full-time coding teacher, Liz Kahn, said. One of the few schools in the United States to provide coding classes to all Lower School students, the goal of MFS has been to help students learn to speak the language of technology in a world that is heavily reliant on computer science. In doing this, Kahn’s more than 220 students — some of whom are as young as 3 years old — have been engaged in the areas of coding, problem solving and teamwork. To develop an understanding of these different elements of coding education from an early age, MFS students participate in the class twice every six days, as it is included in the Lower School’s “specials” rotation that also includes art, music, physical education, library, Quaker education and computer science. Initially, Kahn was hired to teach coding as a replacement for a Spanish language course after it was determined by the administration that Spanish language required additional immersion than merely class twice a week. During coding classes, students learn to navigate, draw and manipulate virtual environments with code. They also learn valuable computational thinking, problem-solving and teamwork skills from completing tasks that involve thinking sequentially. Students furthermore interact with technology in creative ways to understand the basis of algorithms, programing and language. This assists them in wrapping their heads around certain larger concepts such as “if-then” and “if-else” statements and conceptualizing programs with that type of logic. To help to demystify “code,” and to show anybody can learn the basics of code and to broaden participation in the field of computer science, parents are encouraged to register for Sneak Peek Week at the Beginnings at the MFS website beginningsatmfs.org. They can also email admiss@mfriends.org or call (856) 914–4426 with questions or for more information. Spots are limited, and available time slots are listed on the online registration form. For more information on coding at the MFS, visit http://www.mfriends.org/our-program/lower-school/lower-school-curriculum/coding-in-the-lower-school/. For resources and additional information about coding itself, visit code.org.